FORT WORTH, Texas _ Johnny Sauter is threatening to turn the inaugural NASCAR Camping World Truck Series Chase into a one-man show. Sauter’s victory in Friday night’s 18th annual Striping Technology 350 at Texas Motor Speedway was his second in the Round of 6 that will determine which four drivers compete for the championship at Homestead-Miami Speedway on Nov. 18. Sauter secured the first berth in the Championship 4 via his victory last Saturday at Martinsville Speedway. Friday night, Sauter passed two-time series champion Matt Crafton and his No. 88 Toyota Tundra on Lap 145 of the scheduled 147 en route to a margin of victory of 0.836-seconds. Sauter, who led only six laps, scored his third victory of the season and third on TMS’ high-banked/1.5-mile quadoval. Non-Chaser Daniel Hemric finished third in the No. 19 Ford F-150. Non-Chasers Tyler Reddick finished fourth in the No. 29 Ford with Daniel Suarez placing fifth in the No. 51 Toyota. 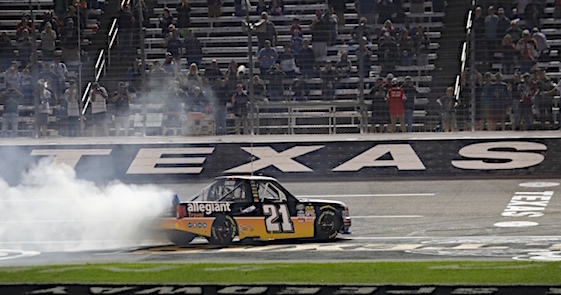 Sauter, who swept the Truck Series races at TMS in 2012, leads the standings by 20 points over William Byron, who won the Rattlesnake 400 here in June. Byron finished sixth in the No. 9 Toyota. Christopher Bell, Byron’s Kyle Busch Motorsports teammate, is third in the standings and only one point behind Byron and 21 points in back of Sauter after an 11th-place finish in the No. 4 JBL Toyota. Crafton is fourth in the standings, 24 points behind the leader. Fellow-Chaser Timothy Peters finished 14th in the No. 17 Red Horse Racing Toyota and is fifth in points, 25 behind the leader. And Chaser Ben Kennedy, who finished 13th in the No. 33 Silverado, is 37 points behind Sauter. Crafton appeared headed to his third series victory here after taking the lead from Sauter on a restart on Lap 130 following the race’s third caution clock expiration. Sauter fell to third, behind Hemric, before rallying into second on Lap 144. Sauter, whose truck is owned by Maurice Gallagher Jr., scored his 13th career victory in 196 NCWTS starts while posting his 17th top-10 finish of 2016. The winning average speed was 148.291 mph. Pole-sitter Spencer Gallagher, Sauter’s GMS Racing teammate, led a race-high 88 laps but saw his victory chances evaporate during that final pit stop. Gallagher entered pit road with the lead but the No. 23 Allegiant Travel Chevy exited in seventh after taking on four Goodyear tires and Sunoco fuel. The final two championship slots will be determined at the 1-mile Phoenix International Raceway next weekend. (16) Johnny Sauter (C), Chevrolet, 147. (7) Matt Crafton (C), Toyota, 147. (2) Daniel Hemric, Ford, 147. (5) Tyler Reddick, Ford, 147. (10) Daniel Suarez(i), Toyota, 147. (3) William Byron # (C), Toyota, 147. (1) Spencer Gallagher, Chevrolet, 147. (22) Austin Dillon(i), Chevrolet, 147. (12) Cole Custer #, Chevrolet, 147. (17) Cameron Hayley, Toyota, 147. (9) Christopher Bell # (C), Toyota, 147. (15) Rico Abreu #, Toyota, 147. (14) Ben Kennedy (C), Chevrolet, 147. (6) Timothy Peters (C), Toyota, 147. (8) Ben Rhodes #, Toyota, 147. (21) Shane Lee, Chevrolet, 147. (4) Matt Tifft #, Toyota, 147. (19) John H Nemechek, Chevrolet, 146. (20) Austin Hill, Ford, 145. (13) Jesse Little, Toyota, 145. (18) Ryan Truex, Toyota, 144. (30) Austin Wayne Self #, Toyota, 144. (24) Casey Smith, Chevrolet, 144. (25) Reed Sorenson(i), Chevrolet, Vibration, 143. (27) Jordan Anderson, Chevrolet, 143. (23) Tyler Young, Chevrolet, 143. (29) Travis Kvapil, Chevrolet, 142. (11) Cody Coughlin #, Chevrolet, 141. (28) Matt Mills, Chevrolet, 140. (32) Jennifer Jo Cobb, Chevrolet, 138. (26) Tommy Joe Martins, Chevrolet, Accident, 61. (31) Norm Benning, Chevrolet, Engine, 22. Average Speed of Race Winner: 148.291 mph. Time of Race: 1 Hrs, 29 Mins, 13 Secs. Margin of Victory: 0.836 Seconds. Lap Leaders: S. Gallagher 1-40; D. Hemric 41-75; S. Gallagher 76-83; D. Hemric 84-86; S. Gallagher 87-126; J. Sauter (C) 127-129; M. Crafton (C) 130-144; J. Sauter (C) 145-147. Leaders Summary (Driver, Times Lead, Laps Led): S. Gallagher 3 times for 88 laps; D. Hemric 2 times for 38 laps; M. Crafton (C) 1 time for 15 laps; J. Sauter (C) 2 times for 6 laps. Top 10 in Points: J. Sauter (C) – 3,072; W. Byron # (C) – 3,052; C. Bell # (C) – 3,051; M. Crafton (C) – 3,048; T. Peters (C) – 3,047; B. Kennedy (C) – 3,035; D. Hemric – 2,115; J. Nemechek – 2,084; T. Reddick – 457; C. Custer # – 456.